April 21, 2013  Abandoned buildings and relics of mining operations at the site of the Tropico Gold Mine in Rosamond, Calif.
Rosamond, est. 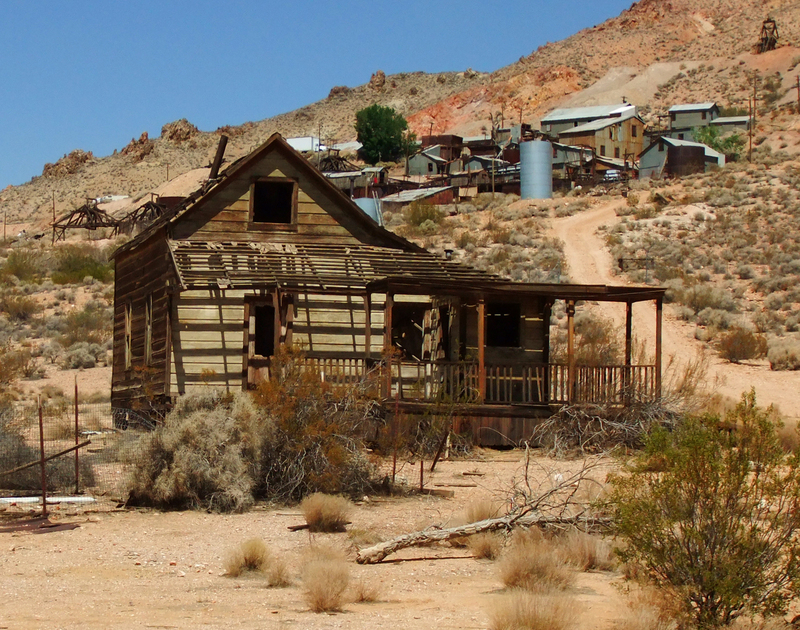 1877, is located in the Mojave Desert. Out of Santa Clarita, take Highway 14 north past Lancaster. The Tropico Gold Mine opened in the 1890s as the Lida Mine. It thrived throughout the first decades of the 20th Century until the late 1950s, by which time the cost of extracing the gold nearly equalled the fixed market price of the yellow metal ($35 per ounce). Its owners turned it into a touristy ghost down but shut it down in the mid-1980s, again amid rising costs  this time in the form of insurance premiums. Today the privately owned property is fenced off  no trespassing. Occasionally the property is used for filming (e.g., "Ocean's Thirteen" starring George Clooney, 2007). The city of Rosamond was another depot on the Southern Pacific Rail Line in 1876 and a trading post for local mines. First known as Bayle Station or Baylesville after postmaster David Bayles (1885), the town was later renamed Rosamond (Rosamond County Library vertical file, n.d.). Rosamond town site lots were obtained from the Southern Pacific by an E.H. Seymour in 1904 and sold to a C.C. Calking three years later (Settle, 1967), who then "sold the mortgage to Charles M. Stinson, who in turn presented [deeded] it to the Union Rescue Mission of Los Angeles who foreclosed the mortgage in 1916. In 1935, the Rescue Mission began selling lots in the townsite, later presenting the remaining property to the community" (Darling, 2003). Prior to the settling and eventual development of Rosamond, Tropico Hill was being mined for clay by Dr. L.A. Crandall who purchased the mine in 1882. Hamilton renamed the mine "Hamilton Hill" and during the course of the clay-mining activities, gold was discovered. Having changed names again, the then known "Lida Mine" was sold to the Antelope Mining Company in 1908 and again to the Tropico Mining and Milling Company in 1909. Eventually the mine was acquired by the Burton brothers in 1912, who were former employees of the Tropico Mining and Milling Company. For a brief period between 1942 and 1946, in support of World War II wartime mining efforts, the mine closed. Once the war was past, the mine reopened and remained in operation until 1956. The Tropic Gold Mine was "one of the most successful gold mines in California" (Cunkelman, 2001). lw2371c: 9600 dpi jpeg from digital image by Leon Worden.